My regular at my local smoothie place is a strawberry and oat breakfast concoction which I just love. It has a slight citrus hit through it and is great at keeping you full until lunch. I thought it would be pretty simple to replicate. Lately though, I can’t make a smoothie without spinach. I feel like despite the fact that the colour is always a bit weird, you can’t really taste it and it is such a waste not to throw in the extra iron, vitamins and magnesium. Plus, adding OJ to spinach helps your body absorb the iron content, so why not include it in any smoothie using oranges. So I made my own version of my fave smoothie to go. I used navel oranges instead of OJ, and added some extra fibre as well. The results: Not the prettiest smoothie I have ever made, but boy it tastes great! Recently the Dragon and I got sick of using a hand held blender in a big plastic container to make smoothies. It doesn’t work well with ice and its just not the best option. We did a heap of research and decided to buy a Nutri Ninja IQ. We weren’t silly enough to buy into the “nutrient extraction” pseudoscience mumbo jumbo. Pulverising something with a blade that pushes it back up and around again does not extract any more nutrients than using a stick blender. It just retains more fibre than normal juicing. Let’s be honest people. What sold me was the ease of use and the smoothness of the smoothies. Also the fact that the blades and other structure seemed sturdier to my (untrained) eye, and that you can use ice, which you can’t in the nutribullet. I like my smoothies cold and thick, so its a match for me. I love them and I’ve been trying a bunch of new combos lately. Over time I will post a few of these on here. So smooth and yummy. I love how many more veggies and fruit I eat now per day compared to before. It takes the pressure off the rest of the day to start with a great breakfast. Oh and this recipe – its gold. Place ingredients in your blender. 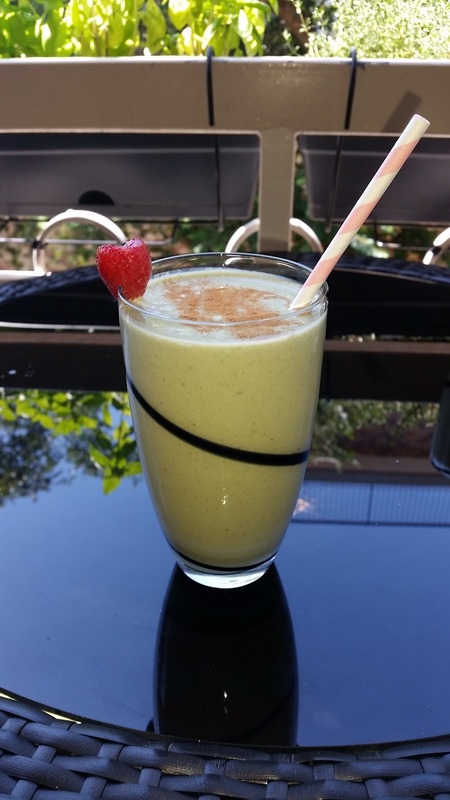 If using a Nutrininja or Nutribullet, start with the spinach, then banana, orange, powders, oats, then strawberries, almond milk and ice (omit ice in the nutribullet). Use the Ultra blend setting. If using a traditional blender: put the ice down the bottom and reverse the order. It tasted fresh, delicious and filling. This become a regular in our household, on rotation with a few other smoothies which I will post in time.